VIDEO: JULIAN ASSANGE FREE OF CHARGES, BUT WHAT'S NEXT? VIDEO: JULIAN ASSANGE FREE OF CHARGES, BUT WHAT’S NEXT? 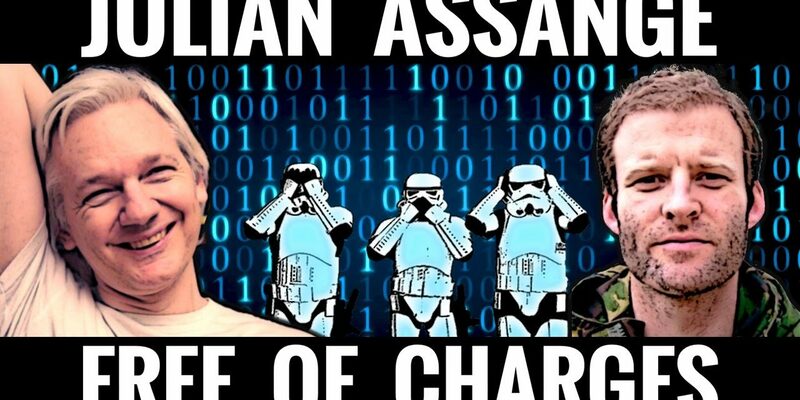 In this breaking news video, Luke Rudkowski of WeAreChange interviews Ben Griffin of Veterans For Peace about the latest information regarding Julian Assange, the founder of Wikileaks. The interview takes place outside 10 Downing Street, where the British government announced earlier today that they will still arrest Assange if he leaves the Embassy, where he has sought refuge for seven years, without charge. Assange entered the Ecuadorian embassy on June 19, 2012, claiming diplomatic asylum after being wanted in Sweden for questioning over four alleged sexual offences. After two months in the Embassy, Assange’s asylum request was eventually granted by the Ecuadorian government on August 16, 2012. Ecuador’s foreign minister, Ricardo Patiño, made the announcement at a news conference in the Ecuadorean capital, Quito. He said “The government of Ecuador, faithful to its tradition of protecting those who seek refuge in its territory or in its diplomatic missions, has decided to grant diplomatic asylum to Julian Assange.” He added, “There are indications to presume that there could be political persecution,” and said Mr. Assange would not get a fair trial in the United States and could face the death penalty there. Over the last seven years Wikileaks have published; The Iraq War Logs, The Afghan War Diaries, Collateral Murder, Cablegate and numerous other government documents that have given insight into the true nature of events. As a result, Wikileaks has made an enemy of the government of the United States of America. Despite these major trials and tribulations, Wikileaks just today published new, important information about the CIA, named Athena, the latest release in the Vault7 series. Athena shows a system of malware to penetrate and spy, targeting all versions of Windows (XP to Win 10) and all conducted without a warrant. RT reports that “Athena “hijacks” the DNSCACHE, a temporary database maintained by the operating system to record internet traffic on the computer, to hide its presence…”. Previous releases showed hacking techniques used to weaponize mobile phones, conduct surveillance via Smart TVs and load and execute malware on a target computer. Make sure to watch Luke’s newest video to find out the news about Julian Assange!